Tyrosine is a non-essential amino acid and is popularly called the anti-stress amino acid. It is derived from phenylalanine, an essential amino acid. It is an essential component of the thyroid hormone. Along with phenylalanine, tyrosine provides raw material from which the body makes the hormones thyroxine and adrenaline. The pigment of the skin and hair, melanin, is also derived from tyrosine. The supplement may be divided into three separate doses per day. When tyrosine is taken, a supplement of valine(an essential amino acid) should not be taken, as valine may block the entry of tyrosine to the brain. Rice, leafy vegetables, curd, cheese, and milk contain generous amounts of tyrosine. 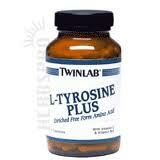 Deficiency of tyrosine can lead to low body temperature, low blood pressure, and a restless feeling in the legs. Brain tyrosine levels are most conveniently raised by ingestion of pure tyrosine, with a high carbohydrate meal. There is evidence that small doses of tyrosine hasten the transmission of impulses in the brain. Tyrosine is also beneficial in the treatment of depression. Research has established this amino acid to be effective in the management and control of depression in conjunction with glutamine, tryptophan, niacin, and vitamin B6.